This book by internationally recognized expert V. Durov includes a wide range of awards, but focuses on the more exquisite pieces bestowed on Russian Nobility. This includes medals, orders, presentation weapons, special insignia and banners. Each award is presented in sharp color close-ups. In many cases, examples of the awards being worn are shown in period oil paintings of the original recipients. Also includes very rare examples of medals instituted by the Provisional Government. 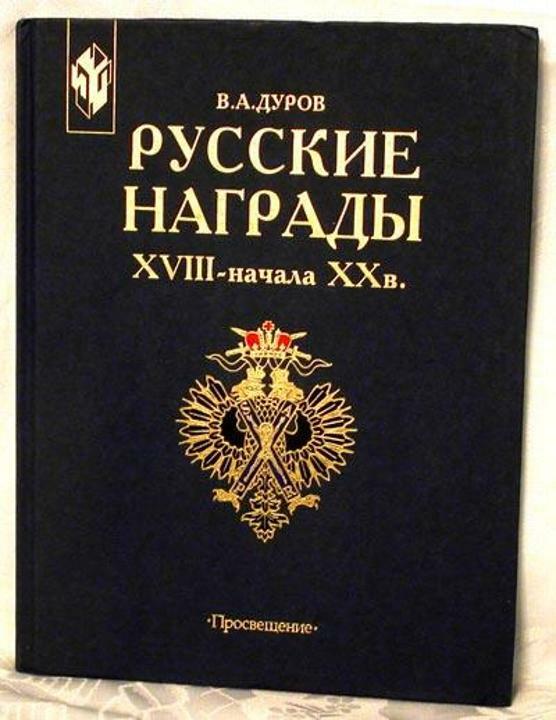 An excellent reference guide book for the Napoleonic or Russian Royalty enthusiast, as well as the advanced medals collector. Large format 9" x 11.5", hardcover 160 pages 1997. Russian text. In very good condition.